HMH Books for Young Readers, 9780544633353, 160pp. 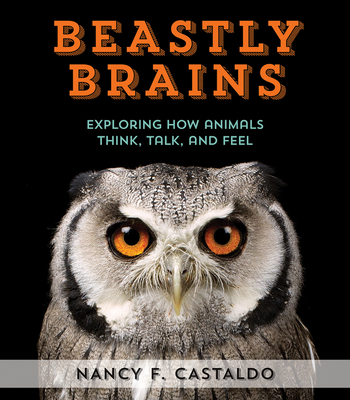 In Beastly Brains, Castaldo delves into the minds of animals and explores animal empathy, communication, tool use, and social societies through interviews and historical anecdotes. Researchers from Charles Darwin to Jane Goodall have spent years analyzing the minds of animals, and today’s science is revolutionizing old theories and uncovering surprising similarities to our own minds. Humans are not alone in our ability to think about ourselves, make plans, help each other, or even participate in deception. You’ll think differently about the animals on this planet—maybe it’s their world and we’re just living in it! Nancy Castaldo is the author of several nonfiction books for children, including Sniffer Dogs: How Dogs (and Their Noses) Save the World, Deserts, Rainforests, and River Wild. She lives in New York’s Hudson Valley with her family. Visit Nancy at nancycastaldo.com, on Twitter at @NCastaldoAuthor, or on Instagram at @naturespeak. * "This eye-opening, cogent, and well-structured volume will enlighten students to both the richness of the animal kingdom and the nature of intelligence itself." "Castaldo (The Story of Seeds) presents a thought-provoking look at the minds and perceptions of animals, as well as the way human understanding of the subject has evolved..."
"The information is conveyed in an enticing way that is sure to spark the interest of aspiring naturalists and researchers... A fascinating take on animal science for tween and teen zoologists."